Gabriel Iglesias, “The Fluffy Guy”, an American stand up comedian, is currently the third top ranked comedian in the world. 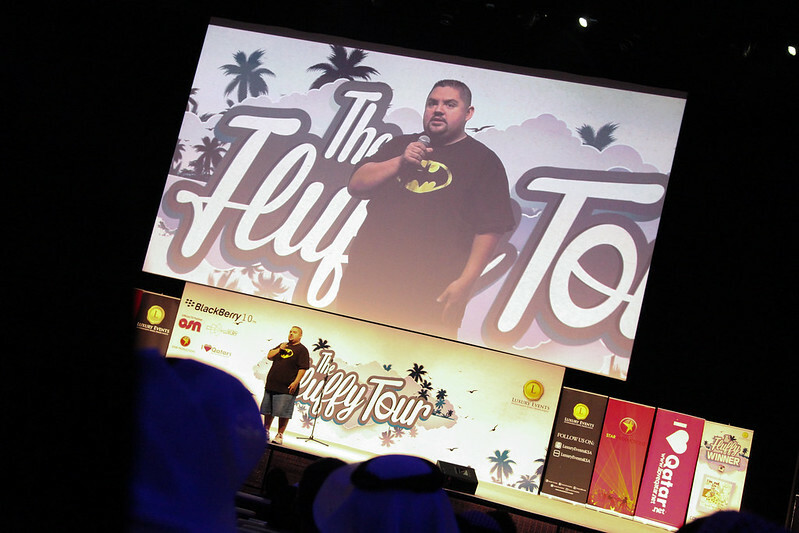 He is known for his unique style in stand-up comedy and is very popular in the GCC, performing at sold out shows in the region in 2011. This year, he performed with Bader Saleh, the most popular stand-up comedian in KSA, who added some Arabic flavor to the show. Bader is famous for his Youtube show which gets more than 4 million hits every episode. He is widely popular in this region especially the GCC. Also on stage were Paul Varghese, Martin Moreno, Ibrahim Khairallah and Mohammed Fahad Kamal, the first Qatari comedian and a member of local Stand-Up Comedy Qatar comedy troupe. The show is produced by Halal Bilal, a South African comedian who is the unofficial Godfather of comedy in Qatar and founder of Stand Up Comedy Qatar. I volunteered to photograph the event and really enjoyed the show.